If you were a kid in the Midwest and ever visited a zoo or museum, you probably ran into one of these machines. They were — and still are — pure magic. 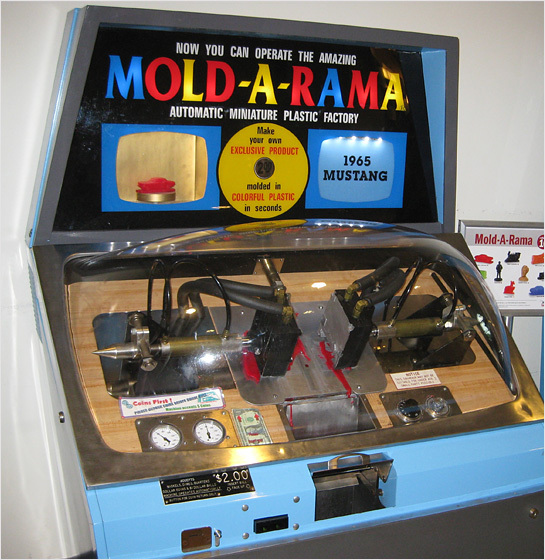 Even if you didn’t recall the name Mold-A-Rama, you might remember the smell and feel of warm, air-molded polyethylene in your hands. For those who’ve never seen one of these machines in-person, they basically work like this: You insert money (today it’s $2.00) and hear the machine spring to life with a loud hum. Hydraulic arms come together in the middle behind the transparent bubble, where plastic enters the chamber as forced air pushes it into the existing mold. 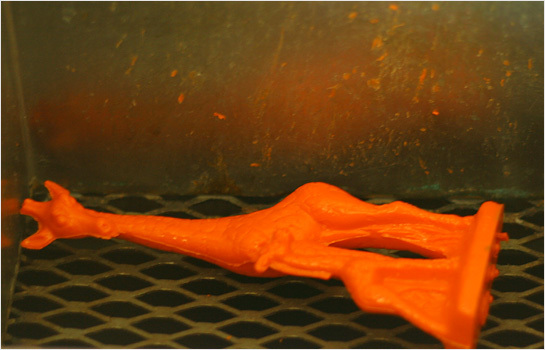 Roughly 45 seconds later, the mold halves pull apart, and another arm pushes the newly-molded piece off the chamber surface and into the opening compartment, where you can retrieve your still-warm plastic toy. See it in action here. But that’s not the end of the story. 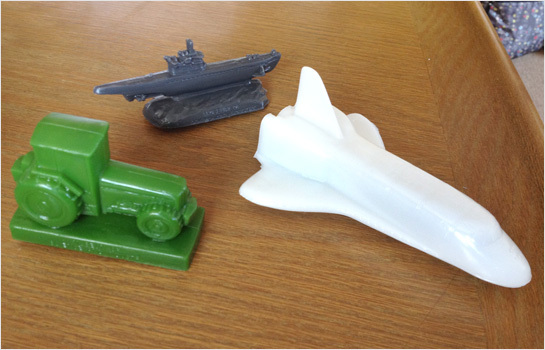 These little plastic figurines have inspired collectors, fan websites, and even new, designer toys. 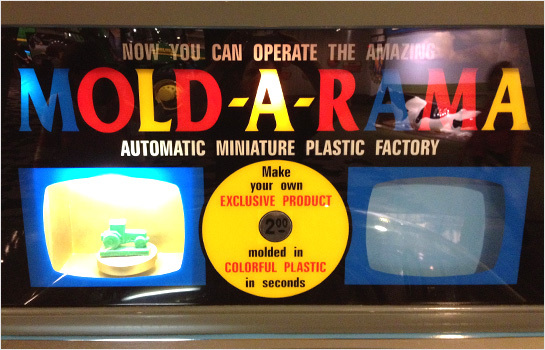 Even local designer toy store Rotofuji has purchased and reworked a Mold-A-Rama machine so it dispenses custom-designed collector toys. Super cool. What does all of this have to do with design and branding? Well, it’s just another reminder how experiences, tied to physical objects, are memorable and fun. Process is super important — how much LESS fun would purchasing one of these air-blown plastic mementos be if you just picked one up in the gift shop? The ability to see the toy-making machine in action, to literally be part of the creation of your piece, is key in the experience and makes all the difference. Today we call this “audience engagement” or “co-creation,” but it’s really just a great, one-of-a-kind experience. 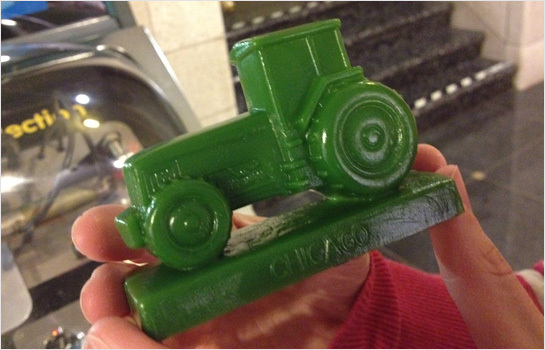 Images of giraffe and one Mold-A-Rama machine courtesy of Jinx! and L. Marie, respectively, via Creative Commons license. I recently witnessed one o’ these at Brookfield Zoo and was overjoyed. Can we get one for the annual meeting? I remember these at Como Zoo in St. Paul. As a tyke it was a great day to get a gorilla or “sparky” the seal from one of their machines. Aaaah yes—the smell. The SMELL! Gina: Yes, these are awesome. I read that Brookfield (where the company is also located) has 13 of them at the zoo! I wish we could afford to have one at ALL AIGA events. Rafe: It’s nice to hear the machines got around. Shawn: You are SO right, my friend. They are awesome. The smell and the still-warmness is all part of the wonderful charm, right? !